A medical research team led by University of Miami doctors injected stem cells into the hearts of pigs that had been damaged by heart attacks. Within two months, the doctors said, the stem cells made the pigs’ hearts good as new. For humans, the research represents another promising step toward healing the damage from heart attacks, the No. 1 cause of death in the United States, killing more than 800,000 people a year. The treatment resulted in rapid healing in the pigs, said Dr. Joshua Hare, a cardiologist at UM Medical School and director of its Interdisciplinary Stem Cell Institute, where research was done. Hare said he hopes that within a decade, the procedure might be routine in humans, and that similar therapy might be available for the liver, kidney, pancreas, brain, even for strokes and limbs badly injured in battle. The new study, published in the July 29 issue of Circulation Research, a journal of the American Heart Association, builds on another UM study published in December. In that study, immature “mesenchymnal” human stem cells extracted from bone marrow and infused into the hearts of human heart-attack victims made their hearts less prone to dangerous arrhythmias and better able to pump blood. That study prompted widespread debate among scientists over how the stem cells were able to promote healing in the heart. The greatest significance of the new research that it explains the healing process, Hare says. Dr. Robert Simari, vice chairman of cardiology at the Mayo Clinic in Rochester, Minn., who had read the study but did not take part in it, supported its significance. The new UM study found that the stem cells helped the heart in two ways. First, some of the stem cells — injected into the heart via catheter into the groin and up the femoral artery — actually turned into new, healthy heart cells themselves. They replaced heart tissue killed by the heart attack, and became part of the heart muscle that contracts and beats to circulate the blood. Another part of the injected stem cells didn’t turn into new heart cells but instead induced stem cells already existing in the heart to greatly multiply, building more heart muscle. Doctors had known the human heart contained some of its own stem cells, whose function is to repair and regenerate the heart. The heart’s stem cells work like the stem cells in hair follicles, which induce the hair to grow back after a haircut, Hare said. But the heart was thought to have too few of them to fully repair itself. In the new experiment, the injected stem cells caused an explosion of growth in the heart’s own stem cells, which turned into heart muscle cells. 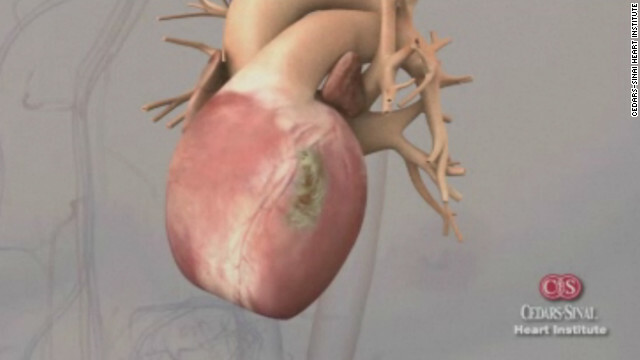 “They helped create 20 times the number of the body’s own heart stem cells,” Hare said. The study demonstrates another way to use immature human stem cells that avoids the use of embryonic stem cells, which are controversial because creating them destroys human embryos. Another advantage is that the experiment worked with stem cells from the bone marrow of unrelated donors, which — for reasons not entirely clear yet — do not seem to carry the same risk of rejection by the recipient’s body, which is a serious problem with heart and kidney transplants. Stem cells extracted from the patient’s own bone marrow also can be used, but they need three weeks of purification and proliferation to be ready, delaying treatment for the ailing heart. New studies are under way to see which method — using cells from a donor or the patient — works better, Hare said. via Stem-cell experiment on pigs seen as step forward in repairing heart damage. via Cytori Reports Stem & Regenerative Cells from Body Fat Improve Outcomes in Heart Attack Clinical Trial; Plans Underway for European Multicenter Pivotal Trial – MarketWatch. Angiograms are the definitive test for people who may have had a heart attack, or who suffer from chest pain. A normal angiogram virtually rules out the possibility of a heart attack. However, a new study finds that this invasive and expensive test yields far fewer positive results than previously thought. Given that angiograms are both expensive and invasive, it would seem that more stringent criteria is needed to determine who requires an angiogram and who does not. It may be that the culture of practicing defensive medicine is responsible for the number of angiograms done on people with normal findings. It is important to keep in mind that angiograms themselves are not without risk, including the risk of bleeding, and should be reserved for those who truly need it. via Blocked Arteries Not Always Found on Angiograms | PreDisease.com Blog. The information below will educate you on the available Repair Stem Cell treatments for heart disease and the scientific data proving their safety, efficacy, benefits and success. Clinical trial illustrates the safety and efficacy of VesCell Repair Stem Cell treatment. Accepted by the American Heart Assn in 2005-6. This trial was a key element in attaining regulatory approval for the treatment protocol that improved the lives of 300 mostly “no-option” heart patients. Bioprocessing Journal scientific paper shows the consistent and reliable manufacturing procedure utilized by VesCell for transforming bone marrow and blood-derived stem cells into angiogenic cell precursors (ACPs) and hematopoietic stem cell (HSC) cellular products for the treatment of severe heart diseases. End product was found to be a) safe and effective; b) prepared from non-mobilized peripheral blood; c) stable, with a relatively long shelf-life; and d) ready-to-use and easily utilized by the physician. Bangkok Heart Hospital and U of Pittsburgh Medical Center/McGowan Institute for Regenerative Medicine clinical trial shows that VesCell type expanded autologous blood derived stem cells utilized in intramyocardial transplantation is feasible and safe in severely ill patients with intractable heart failure in all cases of dilated cardiomyopathy (DCM) and in both first-time and “redo” ischemic cardiomyopathy (ICM) patients. 1. If you did not want or could not get a heart transplant (as is true of 90%+ of dying heart patients in North America) then you had to make a choice between stem cell treatment or standard Western Cardiology methodology. 2. Western Cardiology methodology kept 12% of patients (waiting for heart transplants) alive for five years. 3. Adult/repair Stem cell treatments kept 63% of patients (waiting for heart transplants) alive for five years. More than 5 times more heart transplant candidates lived for 5 years with stem cell treatments than the typical heart transplant recipient! Btw, stem cell science has made huge advancements in treating heart disease over the past seven years. 1. Dr. Amit Patel of Pittsburgh completed two of the most successful trials ever. In Uruguay, he proved, on a group of ischemic heart failure patients, that a bypass plus cells was infinitely better than a bypass only. That same year, TheraVitae, in Israel, developed a new, powerful blood-derived stem cell and dared to treat the sickest patients no clinical trial (except Brazil) would consider. 2. One of the Brazilians, Dr. Perin, came to Texas, used the Brazil results to get the first ASC heart clinical trial approved by the FDA. Over a dozen such approvals were granted in the next 12-18 months. 3. The first-ever commercial stem cell treatment center in the world starts adult stem cell treatment of hundreds of human patients. Results are amazing and include the regrowing of cardiac muscle tissue in patients, significant increases and sometimes a doubling of ejection fractions (the % volume of blood the heart can pump out per beat), etc! Stem cells are also recognized as “smart,” going to where they were needed most, creating micro-vessel bypasses around existing blockages areas, areas that previously were blocked and in areas where stents were implanted. Case Study: James Eilert, 34 years old, presents with a “widowmaker” [100 % blockage of the left ascending coronary artery]. His ejection fraction (EF – volume of blood his heart pumps out) was between 20 and 25 percent (55 is normal). His cardiologist told him he has about 5 years left to live. James left the country in order to receive Repair Stem Cell treatment. · 1 1/2 weeks after treatment – Echocardiogram revealed that his completely dead apex was beating again. · 6 months after treatment – Sidewalls of heart beat normally. Septum went from 100% damage to 30% damage. Cardiologist confirms James’ heart is 50 percent more elastic than the year before Repair Stem Cell therapy. · 6 – 9 months after treatment – James’ total dead heart tissue is down to about 10%. EF is up to 50%! · 4 years later – James’ heart and health continue to improve. He continues to push himself and his limits. He runs regularly, works 7 days a week and can bike 20 miles . · James went from Class III congestive heart failure to Class I with an ejection fraction (EF) increase from ~20-25% to his current EF of 50%. His doctors have lifted all restrictions and limitations on his physical activities. · James is only one of many adult stem cell treatment success stories. · Do Stem Cell Treatments Work? Congratulations on taking your heart health into your own hands! Please let me know if we can be of further assistance! If you have any questions, feel free to ask and please keep us informed on your progress.